O'Brien and assistant Sona Movsesian's journey is must-DVR TV. 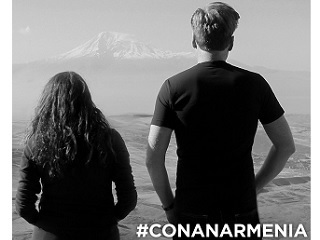 Tonight on Conan, host Conan O’Brien will preview tomorrow’s special one-hour episode, for which he and his assistant Sona Movsesian traveled to Armenia. It was Movsesian’s first trip to her family’s ancestral, native land and while there’s plenty of fun stuff, things also gets emotional for her when the pair visit that country’s main monument dedicated to the memory of the Armenian Genocide. 2015 is the centennial year of the Genocide. For more info about the events of 1915, some of which are still disputed by Turkey, click here.